I went down to Saint John on the 23rd and had a bit of luck. As I crossed the Harbour Bridge I noticed a string of container cars near Harbour Station. I took the next exit, and found twenty-some flats, most loaded, with no engine in sight. I figured something must be coming along to get them soon, so I backtracked to near Reversing Falls. Just as I saw the Reversing Falls bridge, I heard some chatter on the scanner. The NBSR yard planner was telling someone to line the west end switch for the "Tropical boys" to come through. Since many of the containers were Tropical containers, I figured they were on their way to get the cars. I heard a train horn, so I beat it back to the Bentley Street crossing (Google Maps) to wait. 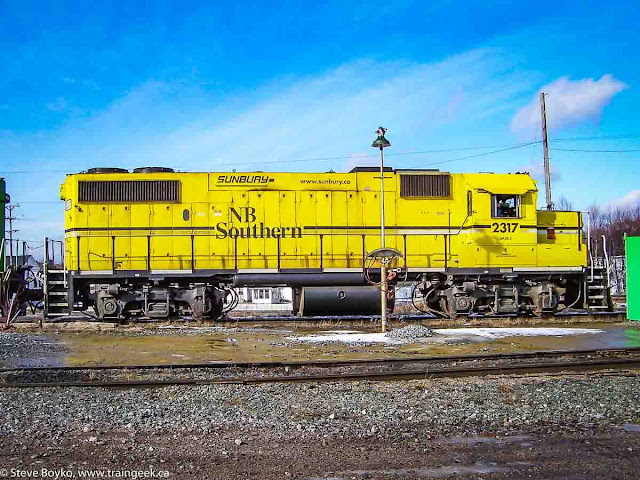 In about six minutes or so, three NB Southern engines came along - SW1200 3703 and 3702 bracketing GP9 3701. They trundled past the Mill Street sign and went down to couple up to the platforms. At 09:43 they started the pull up the hill to the Dever Road yard. I guess they must have had some trouble pulling them up the hill, as they slowed to a slow walking pace. I didn't stick around to see them get all the way up. I wonder if the morning transfer freight had to double the hill, and that's why the containers were left there. There were 23 platforms. At noon I saw CN 7010 shunting the Island Yard, with CN 5746 and 5707 sitting idle in the yard. At 16:30 it looked like another refinery local was being put together or taken apart. CN 7015 and 7000 together with NBSR 79635 were shunting tank cars in Island Yard. CN 5746 and 5707 were still sitting around in the yard. 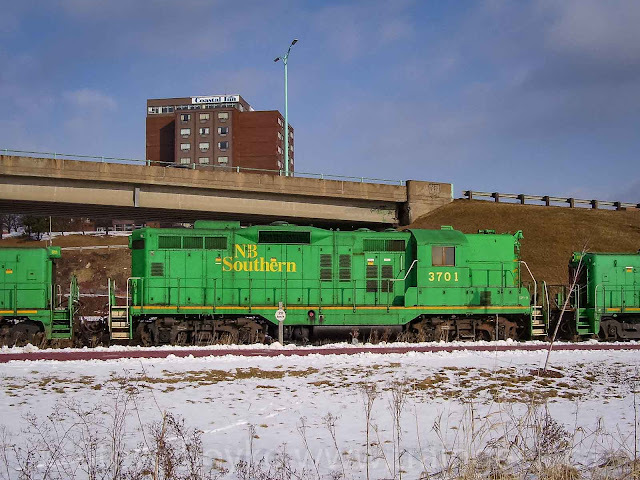 On my way out of Saint John, I heard NBSR 2319 call the RTC and ask where the eastbound freight was. The RTC said it left McAdam at 16:35. If I had another 45 minutes or so I might have caught it at Welsford but time was not on my side, so I didn't see it at all. Petitbone MOW equipment NBSR 151014 was sitting at Westfield Beach, off the rails, when I went by. Aaron Hockley wonders why he tries to shoot mainline action when the shortlines are more interesting. My guess is because you see more action on the class 1's tracks. I shoot a lot more shortline action than class 1 action, partly because I'm around the shortlines more often. Also, on my web site I see far more clicks for NB Southern or New Brunswick East Coast than for CN or VIA. I even moved the CN icon to second place to see if it would make any difference, and it didn't. I guess people can see the class 1's anywhere; information on the shortlines is hard to find elsewhere. Yesterday was an awful day for travelling, but not so bad for trainspotting. VIA 14 arrived at 10:08 with 6419 and 6412 leading a Budd car consist. 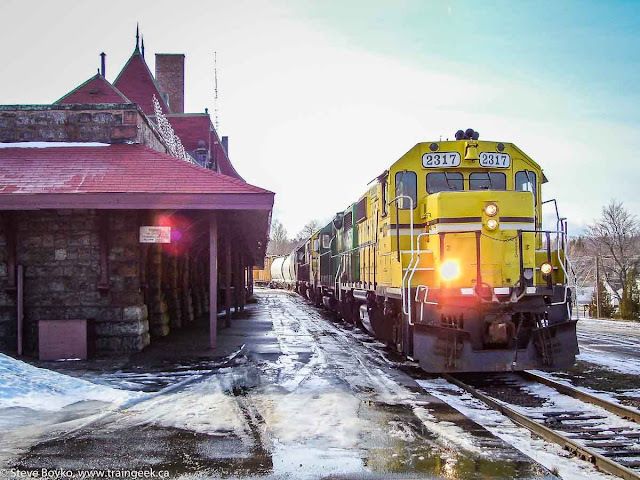 Here are some but not all of the cars: 8622 (baggage), 8141 (coach), 8140 (coach), 8512 (Skyline), 8413 (Diner Louise), 8206 (Chateau Denonville), 8225 (Chateau Rouville), and 8706 (Glacier Park). The train left at 10:15. I saw a ram of tank cars at the Ultramar facility and two NBEC RS18s at the Chatham Mall on my way through. They would prove to be 1840 and 1856 as we shall see. 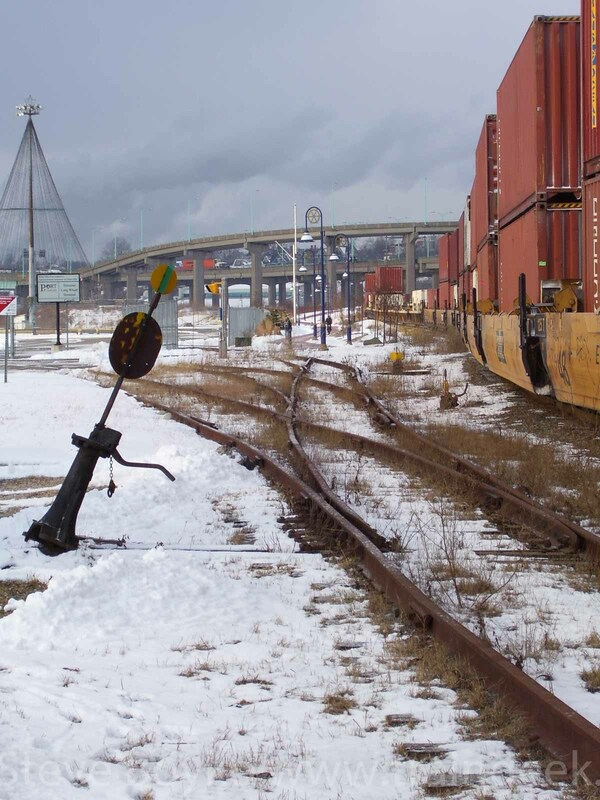 As I passed Bathurst in the freezing rain at 11:10, I heard the yard switcher train 597 getting a clearance. They had NBEC 1819 for power. When I arrived at Belledune at 11:55, I saw there was a cut of cars left on the siding off the mainline, and I heard train 587 (Brunswick Mines to Belledune) chatting away on the scanner. I caught a glimpse of NBEC 1868 and CFQC 3000 pushing a cut of cars into the Brunswick Smelting facility. They had some blue NBEC ore cars and a bunch of boxcars. No pictures - there was no good angle at all. En route past Bathurst on my way out, I heard the Bathurst yard switcher talking to the RTC, who said NBEC 403 would be leaving Miramichi at around 1600. That's a pretty normal time for them. It gives them enough time to keep ahead of VIA 15. On my way back through Miramichi, I found RS18s 1840 and 1856 working the yard as train 587 at 17:55. The light was almost gone and the photos suffer for it. There's only so far you can tweak an almost-black photo! PS: This is post #100! 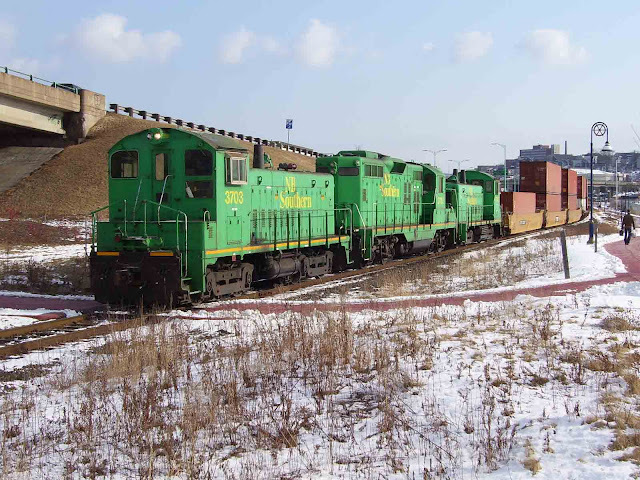 I stood at the same spot and took three photos of the same subject (NB Southern GP38-3 9801). Then I resized them all to 600 pixels high, without doing any other massaging. Here they are. It's obvious the first one is the 1 megapixel camera. It looks so much worse than the rest. 1 megapixel is barely good enough for web photos. I don't see a lot of difference between the second and third photos - do you? Of course, I've removed much of the differences between the 3.2 and the 5 megapixel cameras by resizing the photos for display here. When looking at the original files, I can zoom in a lot more on the 5 megapixel camera before seeing blockiness. I like the C340, and I plan to write a little review on it, but I'm holding out for something like this. One can dream, right? Google has a wonderful service called Google Video where you can view all kinds of videos. I've been sending some of my videos there. Once I remove a video from my video page, I send it to Google and they put it up. This is a list of my videos on Google. I'll try to keep that page updated. So far they have two of my videos online and two are in the process of being reviewed. I've updated the NB Recreational Rail Riders pages to the new format. Have a look! I put a new video of my last sighting online on my video page. NBEC 1816 has gone to the CFC (Chemin de fer de Charlevoix) in Quebec to help them out for a while. That's right, January 28 2004. I thought I'd write about a few old sightings for a change. I passed through Miramichi at about noon on the 28th and saw NBEC 403 pulling up to the crew shack. The power was CFMG 6902, NBEC 4214, NBEC 4210, and CFMG 6909. The rumbling as the engines passed me was quite impressive, as you can hear in this video. NBEC 1821 and 1814 were idling in the yard as train 578. CFMG 6903 was idling away. 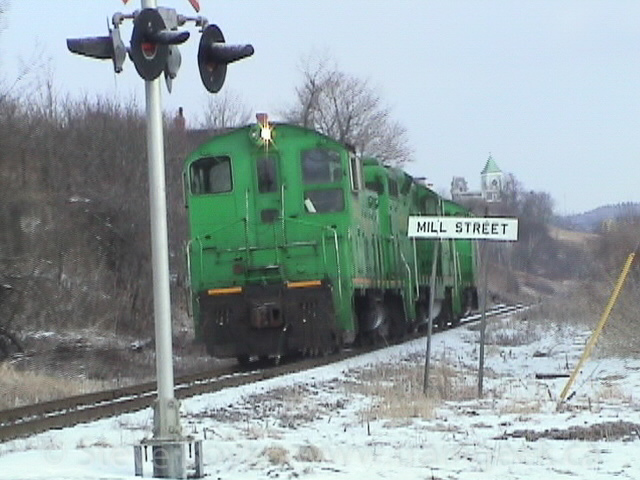 When I passed through again around 15:00 train 403 was gone, and CFMG 6903 was making up its train to take to Moncton.